The white-tailed deer (Odocoileus virginianus), also known as the whitetail or Virginia deer, is a medium-sized deer native to the United States, Canada, Mexico, Central America, and South America as far south as Peru and Bolivia. It has also been introduced to New Zealand, Cuba, Jamaica, Hispaniola, Puerto Rico, the Bahamas, the Lesser Antilles, and some countries in Europe, such as Finland, the Czech Republic, Romania and Serbia. 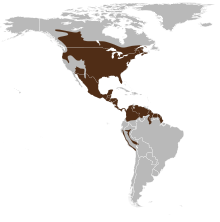 In the Americas, it is the most widely distributed wild ungulate. Some taxonomists have attempted to separate white-tailed deer into a host of subspecies, based largely on morphological differences. Genetic studies,[ clarification needed] however, suggest fewer subspecies within the animal's range, as compared to the 30 to 40 subspecies that some scientists described in the last century. 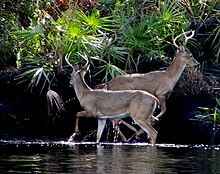 The Florida Key deer, O. v. clavium, and the Columbian white-tailed deer, O. v. leucurus, are both listed as endangered under the U.S. Endangered Species Act. In the United States, the Virginia white-tail, O. v. virginianus, is among the most widespread subspecies. The white-tailed deer species has tremendous genetic variation and is adaptable to several environments. Several local deer populations, especially in the southern states, are descended from white-tailed deer transplanted from various localities east of the Continental Divide. Some of these deer populations may have been from as far north as the Great Lakes region to as far west as Texas, yet are also quite at home in the Appalachian and Piedmont regions of the south. These deer, over time, have intermixed with the local indigenous deer (O. v. virginianus and/or O. v. macrourus) populations. The deer's coat is a reddish-brown in the spring and summer and turns to a grey-brown throughout the fall and winter. The deer can be recognized by the characteristic white underside to its tail. It raises its tail when it is alarmed to warn the predator that it has been detected. A population of white-tailed deer in New York is entirely white (except for areas like their noses and toes)—not albino—in color. The former Seneca Army Depot in Romulus, New York, has the largest known concentration of white deer. An indication of a deer age is the length of the snout and the color of the coat, with older deer tending to have longer snouts and grayer coats. Strong conservation efforts have allowed white deer to thrive within the confines of the depot. White-tailed deer's horizontally slit pupils allow for good night vision and color vision during the day. Deer have dichromatic (two-color) vision with blue and yellow primaries;  humans normally have trichromatic vision. Thus, deer poorly distinguish the oranges and reds that stand out so well to humans. This makes it very convenient to use deer-hunter orange as a safety color on caps and clothing to avoid accidental shootings during hunting seasons. Males regrow their antlers every year. About one in 10,000 females also has antlers, although this is usually associated with freemartinism. Bucks without branching antlers are often termed "spikehorn", "spiked bucks", "spike bucks", or simply "spikes/spikers". The spikes can be quite long or very short. Length and branching of antlers are determined by nutrition, age, and genetics. Rack growth tends to be very important from late spring until about a month before velvet sheds. Healthy deer in some areas that are well-fed can have eight-point branching antlers as yearlings (1.5 years old). The number of points, the length, or thickness of the antlers is a general indication of age, but cannot be relied upon for positive aging. Some say spiked-antler deer should be culled from the population to produce larger branching antler genetics (antler size does not indicate overall health), and some bucks' antlers never will be wall trophies. Good antler-growth nutritional needs (calcium) and good genetics combine to produce wall trophies in some of their range. Spiked bucks are different from "button bucks" or "nubbin' bucks", that are male fawns and are generally about six to nine months of age during their first winter. They have skin-covered nobs on their heads. They can have bony protrusions up to a half inch in length, but that is very rare, and they are not the same as spikes. White-tailed deer are generalists and can adapt to a wide variety of habitats. The largest deer occur in the temperate regions of Canada and United States. The northern white-tailed deer (O. v. borealis), Dakota white-tailed deer (O. v. dacotensis), and northwest white-tailed deer (O. v. ochrourus) are some of the largest animals, with large antlers. 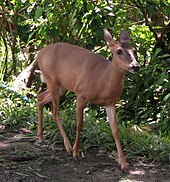 The smallest deer occur in the Florida Keys and in partially wooded lowlands in the neotropics. Although most often thought of as forest animals depending on relatively small openings and edges, white-tailed deer can equally adapt themselves to life in more open prairie, savanna woodlands, and sage communities as in the Southwestern United States and northern Mexico. These savanna-adapted deer have relatively large antlers in proportion to their body size and large tails. Also, a noticeable difference exists in size between male and female deer of the savannas. The Texas white-tailed deer (O. v. texanus), of the prairies and oak savannas of Texas and parts of Mexico, are the largest savanna-adapted deer in the Southwest, with impressive antlers that might rival deer found in Canada and the northern United States. Populations of Arizona (O. v. couesi) and Carmen Mountains (O. v. carminis) white-tailed deer inhabit montane mixed oak and pine woodland communities. The Arizona and Carmen Mountains deer are smaller, but may also have impressive antlers, considering their size. The white-tailed deer of the Llanos region of Colombia and Venezuela (O. v. apurensis and O. v. gymnotis) have antler dimensions similar to the Arizona white-tailed deer. In some western regions of the United States and Canada, the white-tailed deer range overlaps with those of the mule deer. 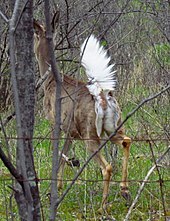 White-tail incursions in the Trans-Pecos region of Texas have resulted in some hybrids. In the extreme north of the range, their habitat is also used by moose in some areas. White-tailed deer may occur in areas that are also exploited by elk (wapiti) such as in mixed deciduous river valley bottomlands and formerly in the mixed deciduous forest of eastern United States. In places such as Glacier National Park in Montana and several national parks in the Columbian Mountains ( Mount Revelstoke National Park) and Canadian Rocky Mountains, as well as in the Yukon Territory ( Yoho National Park and Kootenay National Park), white-tailed deer are shy and more reclusive than the coexisting mule deer, elk, and moose. Central American white-tailed deer prefer tropical and subtropical dry broadleaf forests, seasonal mixed deciduous forests, savanna, and adjacent wetland habitats over dense tropical and subtropical moist broadleaf forests. South American subspecies of white-tailed deer live in two types of environments. 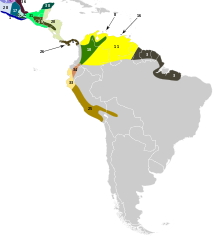 The first type, similar to the Central American deer, consists of savannas, dry deciduous forests, and riparian corridors that cover much of Venezuela and eastern Colombia. The other type is the higher elevation mountain grassland/mixed forest ecozones in the Andes Mountains, from Venezuela to Peru. The Andean white-tailed deer seem to retain gray coats due to the colder weather at high altitudes, whereas the lowland savanna forms retain the reddish brown coats. South American white-tailed deer, like those in Central America, also generally avoid dense moist broadleaf forests. Since the second half of the 19th century, white-tailed deer have been introduced to Europe. A population in the Brdy area remains stable today. In 1935, white-tailed deer were introduced to Finland. The introduction was successful, and the deer have recently begun spreading through northern Scandinavia and southern Karelia, competing with, and sometimes displacing, native species. The current population of some 30,000 deer originated from four animals provided by Finnish Americans from Minnesota. The deer of Virginia can run faster than their predators and have been recorded at speeds of 75 km (47 mi) per hour;  this ranks them amongst the fastest of all cervids, alongside the Eurasian roe deer. They can also jump 2.7 m (8.9 ft) high and up to 10 m (33 ft) in length. When shot at, the white-tailed deer will run at high speeds with its tail down. If frightened, the deer will hop in a zig-zag with its tail straight up. If the deer feels extremely threatened, however, it may charge the person or predator causing the threat, using its antlers or, if none are present, its head to fight off the threat. Translocation has been considered overly costly for the little benefit it provides. Deer experience high stress and are at high risk of dying in the process, putting into question its humaneness. Another concern in using this method is the possible spread of chronic wasting disease found in the deer family and the lack of research on its effect on human populations. Males compete for the opportunity of breeding females. Sparring among males determines a dominance hierarchy. Bucks attempt to copulate with as many females as possible, losing physical condition, since they rarely eat or rest during the rut. The general geographical trend is for the rut to be shorter in duration at increased latitude. Many factors determine how intense the "rutting season" will be; air temperature is a major one. Any time the temperature rises above 40 °F (4 °C), the males do much less traveling looking for females, else they will be subject to overheating or dehydrating. Another factor for the strength in rutting activity is competition. If numerous males are in a particular area, then they compete more for the females. If fewer males or more females are present, then the selection process will not need to be as competitive. White-tailed deer have many forms of communication involving sounds, scent, body language, and marking. 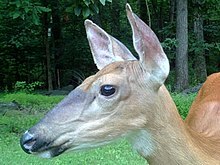 In addition to the aforementioned blowing in the presence of danger, all white-tailed deer are capable of producing audible noises unique to each animal. Fawns release a high-pitched squeal, known as a bleat, to call out to their mothers. This bleat deepens as the fawn grows until it becomes the grunt of the mature deer, a guttural sound that attracts the attention of any other deer in the area. A doe makes maternal grunts when searching for her bedded fawns. 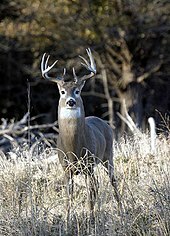 Bucks also grunt, at a pitch lower than that of the doe; this grunt deepens as the buck matures. In addition to grunting, both does and bucks also snort, a sound that often signals an imminent threat. 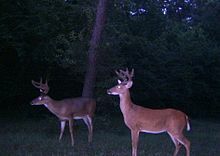 Mature bucks also produce a grunt-snort-wheeze pattern, unique to each animal, that asserts its dominance, aggression, and hostility. Another way white-tailed deer communicate is through the use of their white tail. When spooked, it will raise its tail to warn the other deer in the immediate area. By the early 20th century, commercial exploitation and unregulated hunting had severely depressed deer populations in much of their range. For example, by about 1930, the U.S. population was thought to number about 300,000. After an outcry by hunters and other conservation ecologists, commercial exploitation of deer became illegal and conservation programs along with regulated hunting were introduced. In 2005, estimates put the deer population in the United States at around 30 million. Conservation practices have proved so successful, in parts of their range, the white-tailed deer populations currently far exceed their cultural carrying capacity and the animal may be considered a nuisance. A reduction in natural predators (which normally cull young, sick, or infirm specimens) has undoubtedly contributed to locally abundant populations. At high population densities, farmers can suffer economic damage by deer feeding on cash crops, especially in corn and orchards. It has become nearly impossible to grow some crops in some areas unless very burdensome deer-deterring measures are taken. 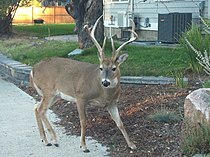 Deer are excellent fence-jumpers, and their fear of motion and sounds meant to scare them away is soon dulled. Timber harvesting and forest clearance have historically resulted in increased deer population densities,   which in turn have slowed the rate of reforestation following logging in some areas. High densities of deer can have severe impacts on native plants and animals in parks and natural areas; however, deer browsing can also promote plant and animal diversity in some areas. Deer can also cause substantial damage to landscape plants in suburban areas, leading to limited hunting or trapping to relocate or sterilize them. In parts of the Eastern US with high deer populations and fragmented woodlands, deer often wander into suburban and urban habitats that are less than ideal for the species. 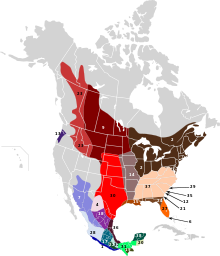 In the U.S., the species is the state animal of Arkansas, Illinois, Michigan, Mississippi, Nebraska, New Hampshire, Ohio, Pennsylvania, and South Carolina, the wildlife symbol of Wisconsin, and game animal of Oklahoma. The profile of a white-tailed deer buck caps the coat of arms of Vermont and can be seen in the flag of Vermont and in stained glass at the Vermont State House. It is the national animal of Honduras and Costa Rica and the provincial animal of Canadian Saskatchewan and Finnish Pirkanmaa. Texas is home to the most white-tailed deer of any U.S. state or Canadian province, with an estimated population of over four million. 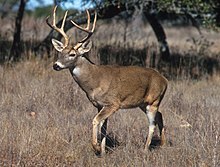 Notably high populations of white-tailed deer occur in the Edwards Plateau of Central Texas. Michigan, Minnesota, Iowa, Mississippi, Missouri, New Jersey, Illinois, Wisconsin, Maryland, New York, North Dakota, Ohio, Pennsylvania, and Indiana also boast high deer densities. In 1884, one of the first hunts of white-tailed deer in Europe was conducted in Opočno and Dobříš ( Brdy Mountains area), in what is now the Czech Republic. Climate change is affecting the white tailed deer by changing their migration patterns and increasing their population size. This species of deer is restricted from moving northward due to cold harsh winters. Consequently, as climate change warms up the Earth, these deer are allowed to migrate further north and “two things are likely to result: (1) the more southerly deer yards will become less critical to survival and (2) deer populations will increase”. 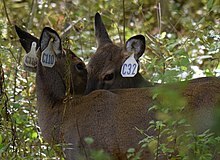 The predicted change in deer populations due to climate change were expected to increase by 40% between 1970 and 1980. “Similarly, the increased probability of white-tailed deer presence in 89% and 90% of the grid cells was driven by changes in climate between 1980 and 1990 and 1990 and 2000, respectively.”  Populations of white tailed deer have also moved anywhere from 50-250 km north of an eastern Alberta study site. “Predicted climate change leads to an 80,900 km^2 increase in predicted white-tailed deer range size in the northern Alberta boreal.”  A study by Kennedy-Slaney, Bowman, Walpole, and Pond showed that “Current CO2 emissions indicate that winter conditions will no longer limit the northern distribution of white-tailed deer in our study area by the year 2100.”  This study also showed that an increase in deer populations will affect populations of other species. ^ Bildstein, Keith L. (May 1983). "Why White-Tailed Deer Flag Their Tails". The American Naturalist. 121 (5): 709–715. doi: 10.1086/284096. JSTOR 2460873. ^ Wislocki, G.B. (1954). "Antlers in Female Deer, with a Report of Three Cases in Odocoileus". Journal of Mammalogy. 35 (4): 486–495. Bibcode: 2007JMamm..88..275L. doi: 10.2307/1375571. JSTOR 1375571. ^ Pietz, Pamela J; Granfors, Diane A (2000). "White-tailed Deer (Odocoileus virginianus) Predation on Grassland Songbird Nestlings". The American Midland Naturalist. 144 (2): 419–422. doi: 10.1674/0003-0031(2000)144[0419:WTDOVP]2.0.CO;2. ^ a b Mathews, N. E.; Porter, W. F. (1988). "Black bear predation on white-tailed deer neonates in the central Adirondacks". Canadian Journal of Zoology. 66 (5): 1241–1242. doi: 10.1139/z88-179. ^ a b Ozoga, J. J.; Clute, R.K. (1988). "Mortality rates of marked and unmarked fawns". Journal of Wildlife Management. 52 (3): 549–551. doi: 10.2307/3801608. JSTOR 3801608. ^ Labisky, Ronald F.; Boulay, Margaret C. (1998). "Behaviors of Bobcats Preying on White-tailed Deer in the Everglades". The American Midland Naturalist. 139 (2): 275–281. doi: 10.1674/0003-0031(1998)139[0275:bobpow]2.0.co;2. ^ Augustine, DJ; Frelich, LE (1998). "Effects of White-Tailed Deer on Populations of an Understory Forb in Fragmented Deciduous Forests". Conservation Biology. 12 (5): 995–1004. doi: 10.1046/j.1523-1739.1998.97248.x. ^ Cote, S.D. ; Rooney, T.P. ; Tremblay, J.; Dussault, C.; Waller, D.M. (2004). "Ecological impacts of deer overabundance". Annual Review of Ecology, Evolution, and Systematics. 35: 113–47. doi: 10.1146/annurev.ecolsys.35.021103.105725. ^ Rooney, T.P. (2009). "High white-tailed deer densities benefit graminoids and contribute to biotic homogenization of forest ground-layer vegetation". Plant Ecology. 202: 103–111. doi: 10.1007/s11258-008-9489-8. ^ McShea, W.J. ; Rappole, J.H. (2000). "Managing the abundance and diversity of breeding bird populations through manipulation of deer populations". Conservation Biology. 14 (4): 1161–1170. doi: 10.1046/j.1523-1739.2000.99210.x. ^ Royo, Alejandro A.; Collins, Rachel; Adams, Mary Beth; Kirschbaum, Chad; Carson, Walter P. (2010). "Pervasive interactions between ungulate browsers and disturbance regimes promote temperate forest herbaceous diversity". Ecology. 91 (1): 93–105. doi: 10.1890/08-1680.1. PMID 20380200. ^ Lucas, Richard W.; Salguero-Gómez, Roberto; Cobb, David B.; Waring, Bonnie G.; Anderson, Frank; McShea, William J.; Casper, Brenda B. (2013). "White-tailed deer (Odocoileus virginianus) positively affect the growth of mature northern red oak (Quercus rubra) trees". Ecosphere. 4 (7): art84. doi: 10.1890/ES13-00036.1. ^ Mladenoff, D.J. ; Stearns, F. (1993). "Easter hemlock regeneration and deer browsing in the northern great lakes region: a re-examination and model simulation". Conservation Biology. 7 (4): 889–900. doi: 10.1046/j.1523-1739.1993.740889.x. ^ Eschtruth, E.C. ; J.J. Battles (2008). "Acceleration of exotic plant invasion in a forested ecosystem by a generalist herbivore". Conservation Biology. 23 (2): 388–399. doi: 10.1111/j.1523-1739.2008.01122.x. PMID 19183209. ^ Ditchkoff, S. S.; Lochmiller, Robert L.; Masters, Ronald E.; Hoofer, Steven R.; Van Den Bussche, Ronald A. (2001). "Major-Histocompatibility-Complex-Associated Variation In Secondary Sexual Traits Of White-Tailed Deer (Odocoileus virginianus): Evidence For Good-Genes Advertisement". Evolution. 55 (3): 616–625. doi: 10.1111/j.0014-3820.2001.tb00794.x. PMID 11327168. ^ Warren, R. J.; et al. (1978). "Reproductive behaviour of captive white-tailed deer". Animal Behaviour. 26: 179–183. doi: 10.1016/0003-3472(78)90017-9. ^ a b c Atkeson, Thomas D.; Marchinton, R. Larry; Miller, Karl V. (1988). "Vocalizations of White-tailed Deer". American Midland Naturalist. 120 (1): 194–200. doi: 10.2307/2425899. JSTOR 2425899. ^ Osborn, David A., et al. " Morphology of the white-tailed deer tarsal gland." Acta Theriologica 45.1 (2000): 117-122. ^ a b Kile, Terry L.; Marchinton, R. Larry (1977). "White-Tailed Deer Rubs and Scrapes: Spatial, Temporal and Physical Characteristics and Social Role". American Midland Naturalist. 97 (2): 257–266. doi: 10.2307/2425092. JSTOR 2425092. ^ Whitney, G.G. (1990). "The history and status of the hemlock-northern hardwood forests of the Allegheny Plateau". Journal of Ecology. 78 (2): 443–458. Bibcode: 2009JEcol..98...74B. doi: 10.2307/2261123. JSTOR 2261123. ^ Côté, SD; Rooney, TP; Tremblay, JP; Dussault, C; Waller, DM (2004). "Ecological impacts of deer overabundance". Annual Review of Ecology, Evolution, and Systematics. 35: 113–147. doi: 10.1146/annurev.ecolsys.35.021103.105725. ^ Greenwald, KR; Petit, LJ; Waite, TA (2008). "Indirect effects of a keystone herbivore elevate local animal diversity". The Journal of Wildlife Management. 72 (6): 1318–1321. doi: 10.2193/2007-491. ^ a b Côté, Steeve D.; Rooney, Thomas P.; Tremblay, Jean-Pierre; Dussault, Christian; Waller, Donald M. (2004). "Ecological Impacts of Deer Overabundance". Annual Review of Ecology, Evolution, and Systematics. 35 (1): 113–147. doi: 10.1146/annurev.ecolsys.35.021103.105725. ^ a b McShea, WJ (2012). "Ecology and management of white-tailed deer in a changing world". Annals of the New York Academy of Sciences. 1249 (1): 45–56. Bibcode: 2012NYASA1249...45M. doi: 10.1111/j.1749-6632.2011.06376.x. PMID 22268688. ^ a b Meisingset, Erling L; Loe, Leif E; Brekkum, Øystein; Mysterud, Atle (2014). "Targeting mitigation efforts: The role of speed limit and road edge clearance for deer–vehicle collisions". The Journal of Wildlife Management. 78 (4): 679–688. doi: 10.1002/jwmg.712. ^ a b Found, Rob; Boyce, Mark S. (2011). 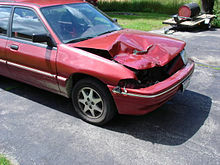 "Predicting deer–vehicle collisions in an urban area". Journal of Environmental Management. 92 (10): 2486–2493. doi: 10.1016/j.jenvman.2011.05.010. PMID 21700381. ^ Levi, T.; Keesing, F.; Oggenfuss, K.; Ostfeld, R. S. (2015). "Accelerated phenology of blacklegged ticks under climate warming". Philosophical Transactions of the Royal Society B: Biological Sciences. 370 (1665): 20130556. doi: 10.1098/rstb.2013.0556. PMC 4342961. PMID 25688016. ^ Hoving, Christopher; Lee, Yu; Badra, Peter; Klatt, Brian (2013). Changing Climate, Changing Wildlife: A Vulnerability Assessment of 400 Species of Greatest Conservation Need and Game Species in Michigan. ISBN https://www.canr.msu.edu/uploads/235/59270/CLIMATE_CHANGE.pdf Check |isbn= value: invalid character ( help).